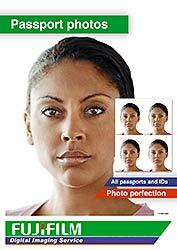 We take Passport photos while you wait! These are ideal to use for driving licenses, identity cards, oyster cards, visas and student cards etc.You can view your images before we print them so you are 100% satisfied with your picture. If you’re not happy, we’ll take another one for you. What's more, we give you a reference number for your picture so if you need copies in the future, you can just quote the reference in store or over over the phone and we'll reprint them at the reduced rate of £4 per set of 4 photos.